My dogs Ace and Remy were super excited they got to try the organic bone broth for dogs from the new company Primalvore. I love the name Primalvore, and this is a new brand I’m eager to share with you. This is the first time my dogs have actually had bone broth, and they seem to love it. 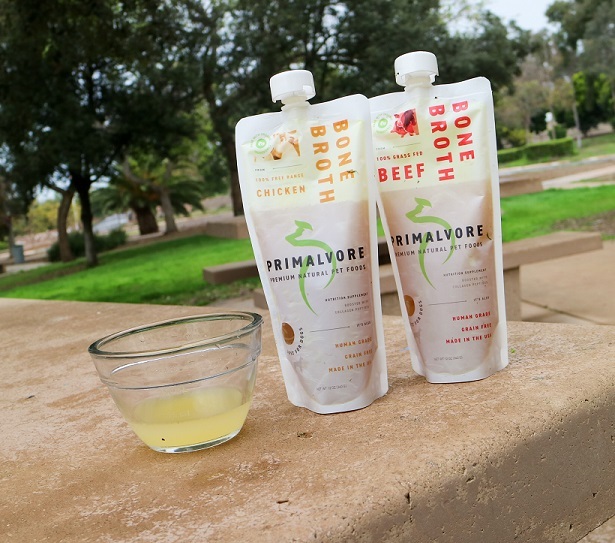 Primalvore’s bone broth is made with organic ingredients and without artificial flavors or preservatives. Primalvore is the sponsor of this post. 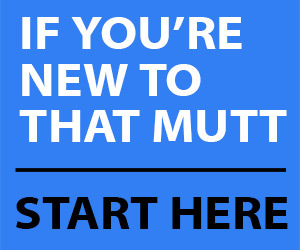 Use code THATMUTT for 20% off your first order. Click here. 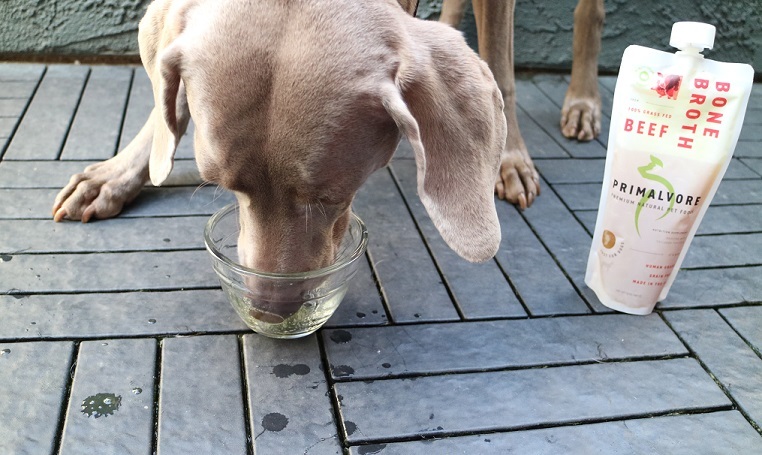 The company is giving away a 12-ounce pouch of organic bone broth to two readers of That Mutt. Just leave a comment at the end of this post to enter. Primalvore’s bone broth is made by slowly simmering bones and water for up to 20 hours. This achieves a rich flavor. The company uses bones from certified organic sources. The company also adds organic turmeric and collagen to the broth. Turmeric is known for its anti-inflammatory properties. Learn more on Primalvore’s website here. The broth currently comes in four flavors: free-range chicken, grass-fed beef, duck or free-range turkey. We received the chicken and the beef. The packages are 12 ounces and resealable (refrigerate after opening). The recommended serving size is about 1 ounce per 10 pounds so I split the pack of 12 ounces between my two 60-pound(ish) dogs. The product is packaged in BPA free standup pouches. The broth contains no additives or artificial ingredients and is made from human grade ingredients and processed in a USDA/FDA approved facility, Primalvore said. The broth has a shelf life of 18 months. The cost is $10.99 per 12-ounce pack. They’re currently on sale for $9.99. Get 20% off if you sign up for a subscription. Order 6 or more pouches and get free shipping. Bone broth is a natural source of minerals, vitamins and amino acids. Primalvore said it can support mobility, gut health, digestion and a healthy coat and nails. Bone broth is a supplement that can be fed to your dog between meals or added to your dog’s food. The broth can be mixed in with dry dog food, raw food or cooked food. Or, you can just feed it cold or warm on its own, depending on what your dog prefers. Primalvore also suggested using the broth to re-hydrate freeze-dried food, and I recommend using it if your dog is a picky eater. It smells yummy! I like Primalvore’s suggested to use the bone broth as a hydration before or after hikes, long walks or dog sports. Since our pup Remy is a distance runner now, clocking 11+ miles in a stretch, we thought this would be healthy treat for him after his Saturday long runs. He loves it! 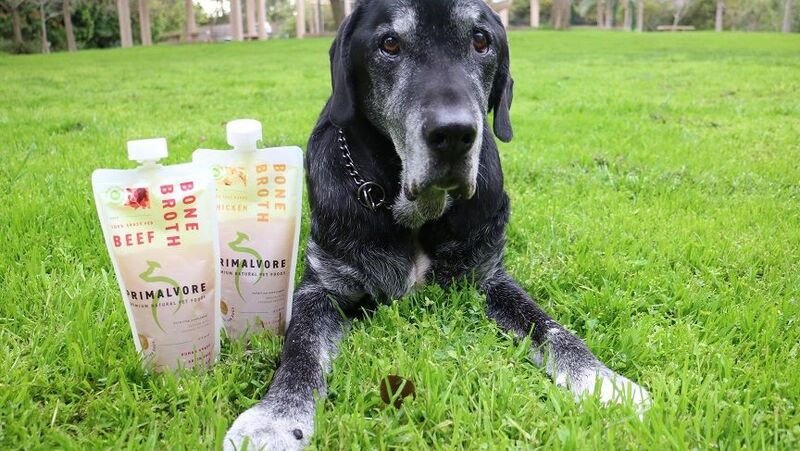 And our senior dog, well, he enjoys the bone broth too of course! I recommend the Primalvore bone broth for anyone who wants to give their dogs a nutritional boost or a healthy treat. If you feed your dog a homemade raw or homecooked diet, this would be a great supplement to add. If you feed your dog dry food, this is a way to add additional nutrients to his diet. ORDER HERE. This product may not be for you if you’d rather make your own bone broth. I’ve never made bone broth, but I know people who enjoy making it for themselves and their dogs. 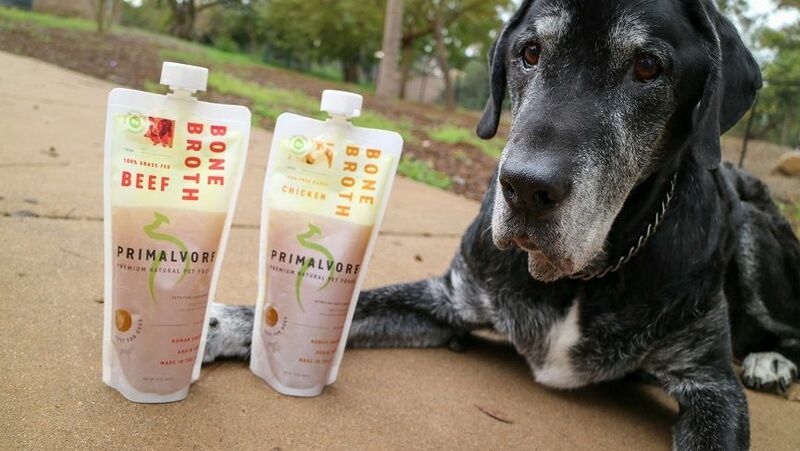 Primalvore is giving away a 12-ounce pouch of bone broth to two readers of That Mutt. To enter, all you need to do is leave a comment below and I’ll choose the winner at random on Tuesday April 3. (U.S. mailing address required to win.) 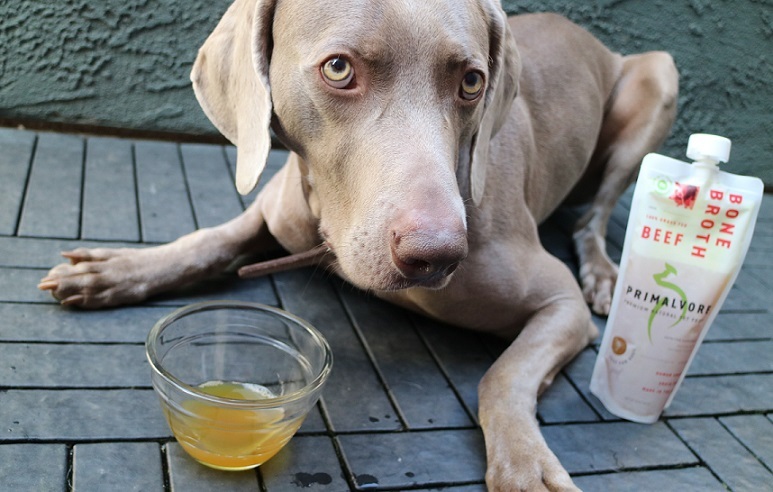 Let us know why your dog would love some bone broth! We’re also offering a separate giveaway through our Instagram page. That info will be available here very soon. Finally, That Mutt’s Patreon members receive automatic entries into all the blog’s giveaways, including this one. Click here to join us and support the blog. Thank you! 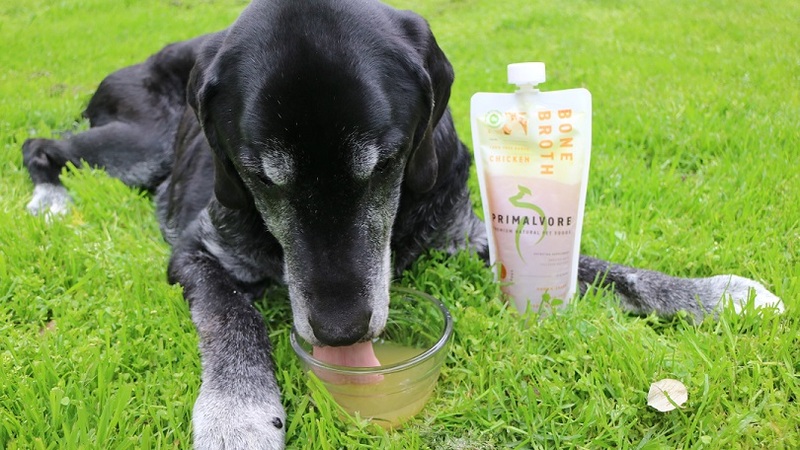 Is your dog interested in Primalvore bone broth for dogs? Let us know in the comments. And please share this post with anyone who might be interested in Primalvore. My Native American Indian Dog pup loves a little bone broth for breakfast. I try to keep some in the freezer but plan to try this product for back up. I think my dog would love this. My two would love this. With the long shelf life, I think this would be a good addition to my “pet emergency bag”. It is also nice to have a reliable back up to home made broth. I was so excited for this until I realised a us shipping address was needed. Anyway, what an amazing product!! Im going to try and source it here in Australia for my two pooches! Those dang shipping costs! I’m glad you are interested in this product though! I’ve had a finicky pup eater the last 2 months and he’s finally decided that chicken and it’s broth is a good meal. Ied be very interested in trying this product as it may also help with his appetite and well being. My senior dog can be picky too; I think sometimes he’s not feeling great. The broth helps! Mr. fussy eater Shaggy would probably love this. He has a home cooked meal every day, either liver, a “Shaggyburger”, or chicken. Enjoy your blogs … have learned a lot! This is great for dogs who are under the weather as well. I’m so glad to see bone broth catching on, it should be a staple in all homes. I make it when I can for myself and my arthritic Great Danes. My boys Magic and Spots would love some bone broth to add a little flavor to their kibble ! I would love to try this with my 5 mo. old puppy! IF Loki likes it, it will become a staple with his food. thanks and love this blog!! Good to hear! You’re welcome! My 11 year old Shepherd mix Cookie, 2 year old Aussie mix Sunshine and the newest member of my zoo, 2 1/2 year old golden retriever Murphy would love to add bone broth to their raw diet! I’m so dedicated to their health and I know proper nutrition is first and foremost…important and vital!!! I drink bone broth myself, but never thought of it as an option for my dog. What a great concept! My two labradors would love to try this product, sounds wholesome and great! Would love to win some bone broth for my 4 year old golden cocker mix. Think she would love it. Enjoy your wonderful blog! Our three pups love bone broth and I would love to try this product. Our family has two rescues, a lab mix, a Border Collie mix, and an Aussiedoodle (in training to be a therapy dog). We’d love to try the bone broth! I know they love chicken broth when I make it, but I worry it’s too salty for them. This sounds like just what my dog, Phil — half lab/half Catahoula needs after one of our 8mi. runs! I’ve been hearing about bone broth for dogs. I would love for my Lyric to try it. My dog and I could use something like this. Sounds like something he would like. I have tried a lot of different things, but this might work. Kado is 12 years old and has joint problems and I bet he would love this. Sounds interesting to try and I bet that he would love it if froze them into ice cube trays for a nice cool treat on Summer days. IVe heard of bone broth. Great read on this. Thanks for the chance to be able to win one. We make our own bone broth, but it sure would be nice to try this and have it on hand for those times we fall behind. Steel would love to try some Primalvore bone broth because she loves bone broth and variety is the spice of life. On a side note, I love your bowls. It’s hard to find something that deep that isn’t huge. They are bowls I got from Pampered Chef. Thank you! I just looked them up. Do you know if they are one or two cups? Have a great week! I appreciate it! I think they will be perfect here. My lab, Steel, occasionally springs a leak. I believe this will help contain it! Molimo comes to the kitchen every morning looking for her “morning shot.” I’m sure she would love to try another flavor and brand. Kiki is a big fan already. Thanks. Your blog is a welcome wagon of news and views. 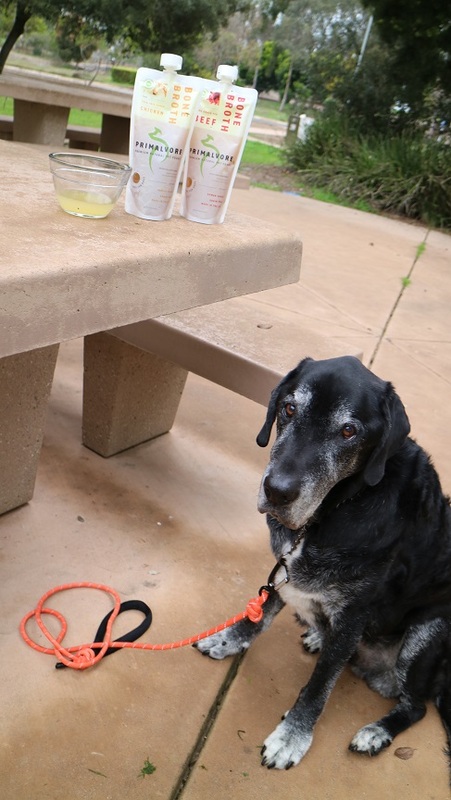 My dogs love when I give them homemade chicken broth as a treat; bone broth would be much more flavorful since it is cooked longer, so I bet they’d love it even more. I have been making “carcus soup” for years during the Thanksgiving holidays. I throw all the scrap meat on the bone into a large pot and boil the mess out of it. It makes for a great turkey broth for soup.